Conflict always has been and always will be a part of this world. Ranging from brutal military conquests that determine the fate of millions of people, to a simple sports rivalry of opposing teams, humans always seem to find a way to fight against each other. While the Billboard Battle of BMW vs Audi, may not be on the same scale of importance as the decisive World War II battle of Stalingrad, for our industry it was groundbreaking. Never before had companies used outdoor media not just to communicate with the general public, but to purposefully create a conflict between brands. While this was clearly done for the amusement of the public, the exposure and success was monumental. It all began in a wealthy neighborhood of Los Angeles, California. 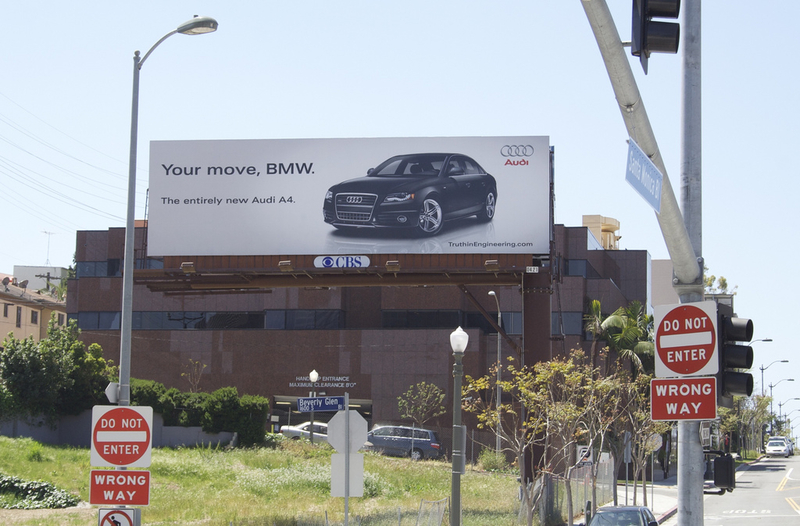 Audi was the aggressor in the billboard battle and started with the simple billboard below. The drivers of Los Angeles who passed by this billboard on a daily basis had no clue what this innocent and simple outdoor advertisement was going to cause. 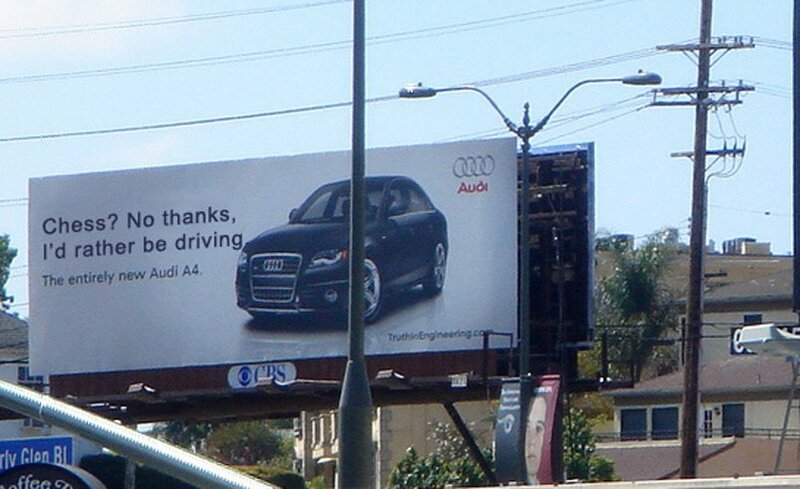 After a short time, Audi switched out this billboard with the one below, provoking a response from BMW. While BMW could have chosen to ignore Audi’s attempt to get under their skin, they decided to strike back instead. This follow-up billboard was located on Santa Monica Blvd. in a very high traffic area of Los Angeles. 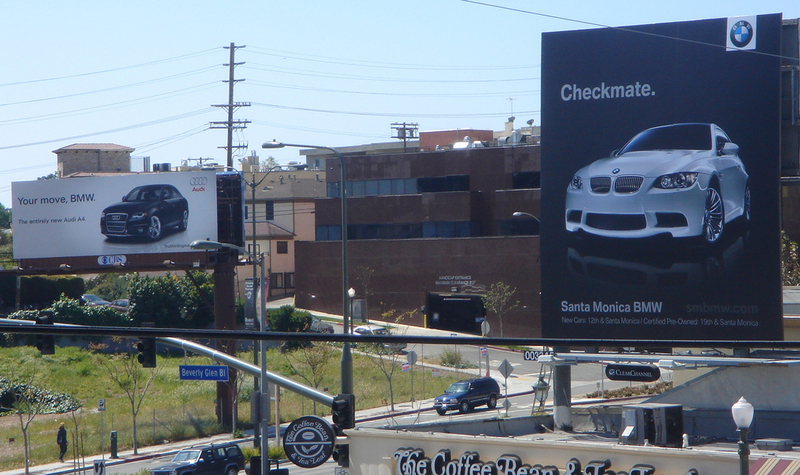 It was also strategically placed across the street from Audi’s ‘Your Move’ billboard, where BMW took a bold approach with a powerful one-word response of ‘Checkmate.’ This was a very successful retaliation on their part which sparked a whirlwind of publicity in the news and on social media for both brands. In response to BMW’s retaliation and to take advantage of the new social media attention, Audi held a Facebook contest for users to create a photoshopped response to BWM’s claim to further fuel the war. While many people had some very creative idea’s about what should be Audi’s next move, eventually they responded with the billboard below. 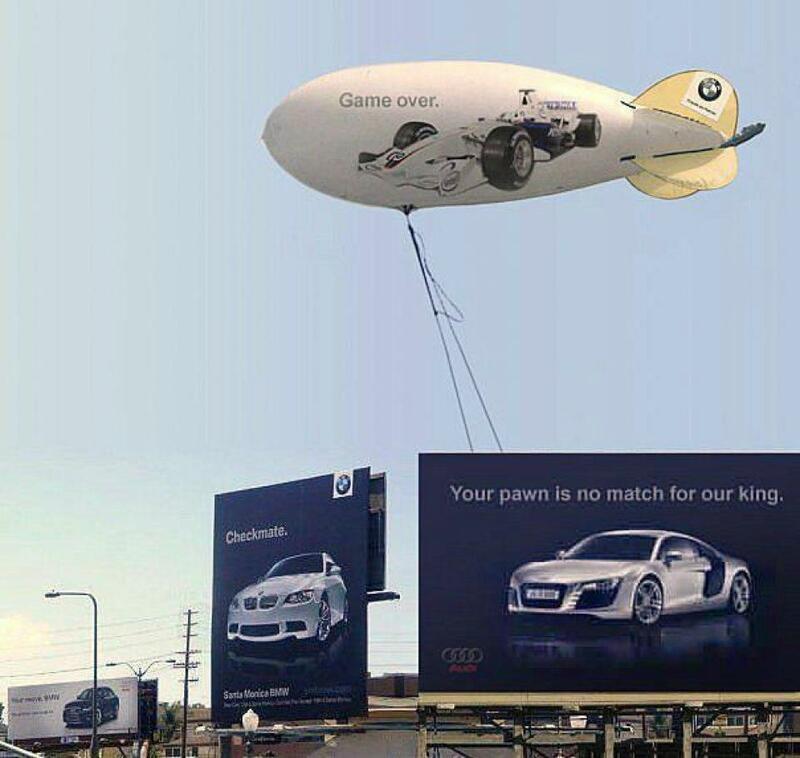 In this billboard with another very bold claim, Audi showcased their extremely powerful and expensive vehicle, the R8, on a nearby billboard with the phrase ‘Your pawn is no match for our king.’ Many people thought this would be the clever ending to the battle of creativity and advertising budgets between the two German luxury auto manufacturers. BMW took matters into their own hands to put an end to this billboard battle. Featuring their Formula 1 car, BMW paid for a branded blimp to be tethered to the Audi billboard with the intention of both ending the battle and claiming themselves the victors. While some might say that BMW’s final attack meant victory for the Munich-based luxury car brand, the truth is both companies reaped the benefits of the war. As the objective of billboard advertising is to get as many eyes on your billboard and brand as possible, this conflict that sparked a wave of PR and social media attention was very valuable for both sides. 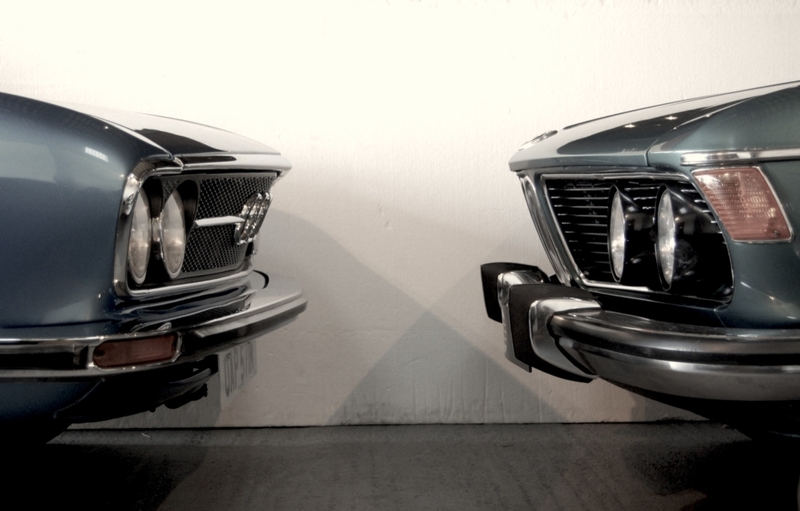 To this day, both BMW and Audi have a very healthy rivalry and while there have been no battles of the same magnitude as this one, they are often taking shots at each other across various mediums of advertising.